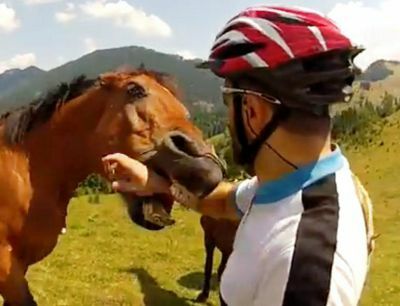 This biting horse is actually a wild horse, not a domesticated horse. For the last eight years, the state of Connecticut has wrestled with the question of whether horses are naturally mischievous or vicious. To the relief of horse owners and handlers of horses, the decision was made that domesticated horses are not wild animals, and as such are not “inherently dangerous.” Whew! The case started in 2006 when a horse named Scuppy bit a 2 year old boy on his cheek. Read more about the case here. In 2010, a Connecticut appellate court ruled that all horses, as a practical matter, are wild and are a species naturally inclined to do mischief or be vicious. This did not bode well for horse owners, boarding facilities or handlers. A ruling like that would drive insurance coverage through the roof and would most likely make it impossible for riding schools or boarding facilities to operate. Happily, Governor Dannel Malloy introduced legislature designed to protect horse owners — and the state’s $3.5 billion agriculture industry — by clarifying into law that domesticated horses are not wild animals and are not “inherently dangerous” and that civil cases involving domestic horses that bite need to be settled on an individual basis.